The Liberty Heavy Duty Magnetic Catch with Strike is ideal for wardrobe and cabinet doors. Its magnetic pull closes doors securely. Magnetic catch provides complete and secure closure. Liberty products provide unmatched quality with long-lasting durability that you can count on. Secure cabinet or cupboard doors with this economy magnetic catch that features standard magnetic pull force to help ensure that your doors stay shut. Perfect for larger DIY or simple repair and replace projects. From Liberty Hardware, the Half-Spoon Foot Pull offers classic, yet casual style. Crafted from die-cast zinc for long lasting quality and durability. Mounting hardware is included for easy installation. The Liberty 3inch Classic Square pull is the perfect touch to a wide variety of styles in cabinetry. The classic but sleek square design in the Soft Iron finish can make any room look casual but updated. The pull is constructed with zinc for long lasting durability. Casual yet timeless, the Contempo Pull is the ideal solution for updating your cabinetry. The brilliant, mirror-like finish of polished chrome on this pull creates a calm and inviting feel to any room. It's a simple way to instantly transform your cabinetry from boring to beautiful. 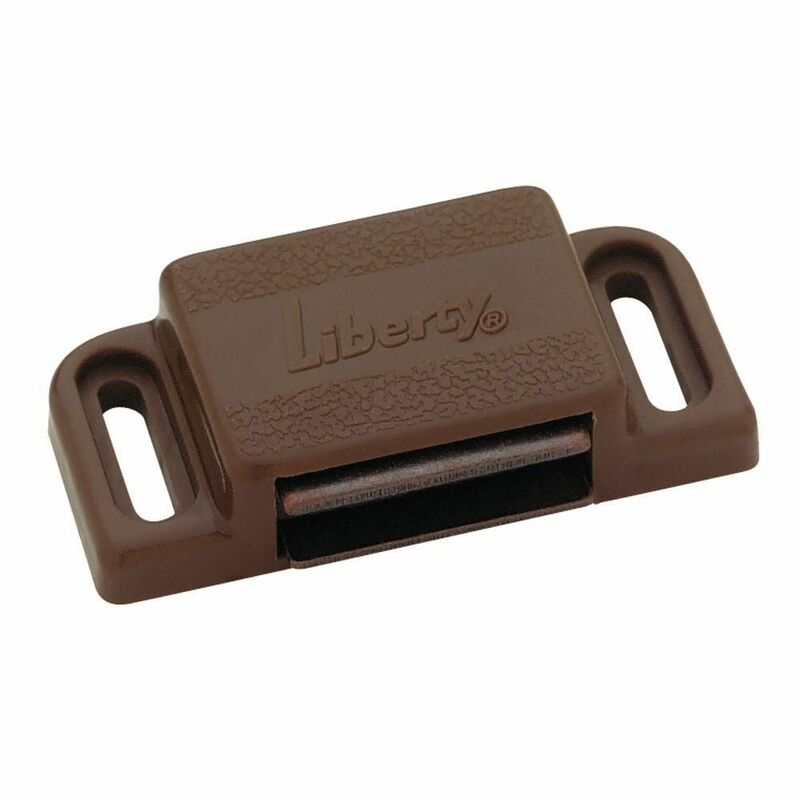 Heavy Duty Magnetic Catch with Strike BROWN The Liberty Heavy Duty Magnetic Catch with Strike is ideal for wardrobe and cabinet doors. Its magnetic pull closes doors securely. Magnetic catch provides complete and secure closure. Heavy Duty Magnetic Catch with Strike BROWN is rated 4.7 out of 5 by 6. Rated 4 out of 5 by Steve from I have used this magnet many times and it works... I have used this magnet many times and it works so much better than the smaller ones. Rated 4 out of 5 by MParker from Cost effective & easy to install.... Cost effective & easy to install. Rated 5 out of 5 by devastatecharlie from Very strong magnet. Easy to install. Very strong magnet. Easy to install.